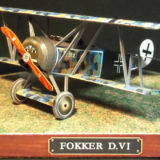 Undoubtedly the most famous fighter of World War 1, the Fokker Dr.I was a revelation when it entered service on the western front in 1917. Manfred von Richthofen’s JG 1 was the first Jasta to completely re-equip with the new fighter, and in the skilled hands of its numerous aces the Dr.I proved a formidable opponent. 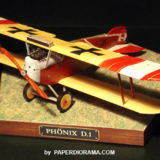 The Dr I remained in service on the Western Front until replaced by the superior Fokker D VII in May 1918. Just weeks prior to that, however, Germany’s leading ace, the great ‘Red Baron’, had been killed at the controls of a Dr.I. The revolutionary triplane design adopted by Fokker was inspired by the equally successful Sopwith’s Triplane, and although built in remarkably small numbers, the Fokker Triplane legend has made it the best known aircraft to emerge from World War 1. Operational history – The first two pre-production triplanes were designated F.I, in accord with Idflieg’s early class prefix for triplanes. These aircraft, serials 102/17 and 103/17, were the only machines to receive the F.I designation and could be distinguished from subsequent aircraft by a slight convex curve of the tailplane’s leading edge. The two aircraft were sent to Jastas 10 and 11 for combat evaluation, arriving at Markebeeke, Belgium on 28 August 1917. Richthofen first flew 102/17 on 1 September 1917 and shot down two enemy aircraft in the next two days. He reported to the Kogenluft (Kommandierender General der Luftstreitkräfte) that the F.I was superior to the Sopwith Triplane. Richthofen recommended that fighter squadrons be reequipped with the new aircraft as soon as possible. 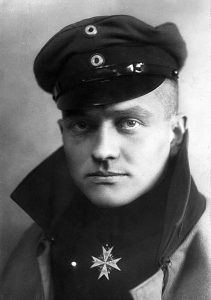 Manfred Albrecht Freiherr von Richthofen (2 May 1892 – 21 April 1918), also widely known as the Red Baron, was a German fighter pilot with the Imperial German Army Air Service (Luftstreitkräfte) during the First World War. He is considered the ace-of-aces of the war, being officially credited with 80 air combat victories. Originally a cavalryman, Richthofen transferred to the Air Service in 1915, becoming one of the first members of Jasta 2 in 1916. He quickly distinguished himself as a fighter pilot, and during 1917 became leader of Jasta 11 and then the larger unit Jagdgeschwader 1 (better known as the “Flying Circus”). He was never called that during his lifetime. His German title “Freiherr” roughly translates as baron, but that moniker only came about later, and its origin remains hazy. 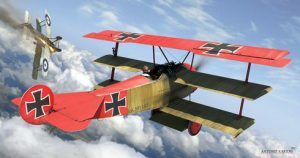 Manfred von Richthofen later came to be known as the “Red Baron,” first in English, later also in German (der Rote Baron). In his own diaries, the aviator referred to himself as “der rote Kampfflieger” (“the red fighter pilot”), a term that referred to his bright red aircraft. The French called him “Le Diable Rouge” (“the Red Devil”). 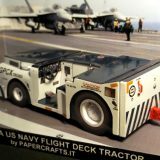 Only after the war did the “Red Baron” nickname come into use. On April 21, 1918 Richthofen flew off with nine other planes from the airfield at Cappy, France. Soon the German fliers were in combat with a squadron of RAF Sopwith Camels led by the Canadian pilot Arthur Roy Brown. At some point during this battle Richthofen was pursuing a plane piloted by a novice Canadian pilot named Wilfrid May. When Richthofen flew across the British lines at low altitude, he was struck by a single bullet and fatally wounded. Before he died, he managed to land his red Fokker Dr.1 triplane just north of the village of Vaux-sur-Somme, in a sector controlled by Australian forces. Still intact, the Red Baron’s bright red plane was soon dismantled by souvenir seekers.